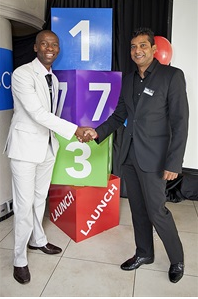 INTEC College launched its 173 new accredited programmes and handed R20,000 worth of bursaries to key industry professionals, at a ‘breakfast with a difference’ at the Blue Waters Hotel on Friday, 4 April 2014. The breakfast was attended by over 50 top companies in KwaZulu-Natal. INTEC’s 173 accredited programmes were endorsed by the South African Qualifications Authority (SAQA), which is a statutory body, regulated in terms of the National Quality Framework (NQF) Act.SAQA is mandated by legislation to oversee the development and implementation of the NQF.The event included keynote addresses from SAQA and the South African Board of People Practices (SABPP) as well as entertainment from Mo Magic, who brought his own charisma to the event by demonstrating the 173 programmes with magic. The breakfast morning also featured the INTEC 173 brand ambassador Makhosi Khoza. Makhosi is a South African radio personality, motivational speaker, businessman and a proud INTEC student, studying towards a Higher Diploma in Public Relations. Ecstatic bursary recipients, who were nearly brought to tears following the life-changing announcement, added an electric atmosphere to the morning. Charmaine Steenkamp of JDG Financial Services, Neermalla Gounder of EXR Construction and Celeste Bloom of Life Entabeni Hospital now have the opportunity to choose from one of INTEC College’s five schools including, Business School, Computer School, Creative School, Technical School and Vocational School, and pursue one of the 173 programmes of their dreams. The 173 programmes include courses in various disciplines ranging from Accounting, Marketing, Human Resources, Paralegal Studies, Computer Studies, Fashion Design, Interior Decorating, Beauty Care, Radio Broadcasting, Electrical and Draughting, Woodwork, Chemistry, Early Childhood Development, Healthcare and Tourism, among others. Look out for news on regional launches to be held in Johannesburg and Cape Town in April and May.For further information on the 173 programmes, visit www.intec.edu.za. Article issued by INTEC College.